This was week two painting with oils and I am having a blast. Guennadi Kalanine is a great instructor and seems to know just what instruction/criticism I need to get to the next stage. I continued to work on the still life that I started last week. It took me a whole class to get everything painted and then a second class to refine it. I am very pleased with it as my first painting. I need to get more aggressive and work more quickly if I am going to take my oils outside. I suspect that "Alla prima" oil painting especially if done "en plein air" isn't for cowards. I am really excited about this. Because watercolours freeze outside in the winter I decided to take a beginner oil painting course. I did an oil painting when I was about 14 and a colour chart about a week ago. That is the total of my oil painting experience. Until today. Last week was taken up with discussions of materials and safety. No painting. This week Guennadi did a demo of this painting to quickly show us how it is done and then he set us loose to try it ourselves. He then walked around helping us out. I have not been this excited in a long while. It was as much fun as playing in the mud. I have a lot of learning to go but I am really stoked about where this is going to take me. I am very proud of this considering it is really my first ever oil painting and I have never liked doing a "still life" before. Therein lies my conundrum. I am a watercolourist. My site says that, my cards say that and everyone knows that is what I do. I may have to completely redesign my website after this. It might be worth it though. Anyone have any thoughts? It was another fantastic day to paint outside. There were a number of artists from the Burlington Fine Arts Guild painting at the RBG today but John and I didn't manage to hook up with them. I suspect that they stayed up top and didn't venture down the slippery slope to the waters edge. 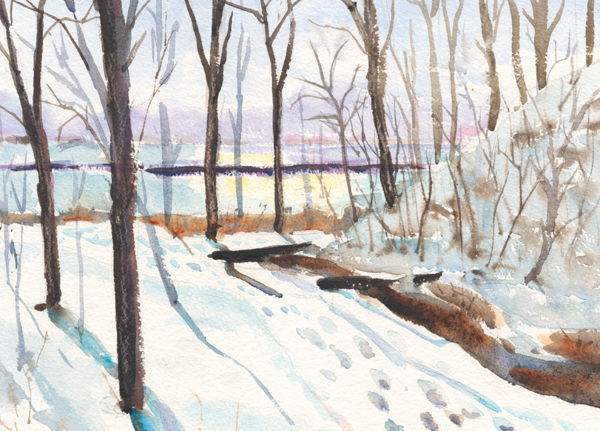 We had sun overhead, snow on the ground and enough warmth that my watercolours didn't freeze on me so it was a perfect day. I am happy with this. There is a lot that I would do differently next time but I am okay with it. The sun reflected off the ice of Coote's Paradise was almost blinding but it gave us nice long shadows and warmth as well. I love watercolours however I am looking forward to much colder weather as an excuse to play with oils for a while. I am trying too hard with the watercolours and I think that a change will be good for me.